BMW i3: Can I Fit My Bass In The Boot? We are looking to add a new BMW to our family and have been very interested in the BMW i3 to act as a family shuttle around town. We, however, have a unique requirement for our future family vehicle. My daughter plays the Bass in orchestra at school, so this means we get to shuttle her massive stringed animal around rather quite frequently. Currently it gets shuttled about in a BMW X3 which works great, but were interested in an all electric conveyance. Enter the 2014 BMW i3, a five-door car with a big looking boot. I envisioned that the i3 would fit the three quarters of a Bass. Plus I wanted to so see how it fits in the garage and how hard it would be to stuff the big Bass in it. Fortunately I was able to convince my local BMW dealer, Baron BMW, to let us take one home to put it to the Vossler family acid test. Once we got it home, popped the hatch, took the back deck lid out and layer the seats down. The seats have two cloth pulls that you can grab from either the boot side or the angle of the seat back and bottom cushion. Once the seats are laid down, there is a very large open flat surface. Lifting the Bass up, I notice that the level of the storage are of the i3 is rather high. This made placing the behemoth up in the boot rather easy. As it slid forward, the neck of the Bass looked like it might be a problem. Not so thankfully! The neck slid easily between the two seats. 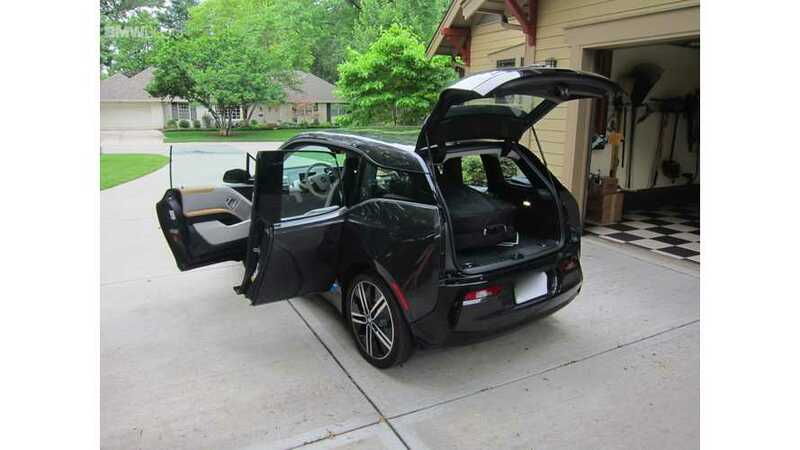 As the loading surface of the i3 is so high, there was no torque placed on the Bass neck. Our interest in the fully electric i3 has to do with our short daily driving, so the BEV version makes sense for us. For those with longer commutes there is a BMW i3 REx which comes with a rear-mounted 650cc, 34 hp, two-cylinder, gasoline- powered Range Extender generator is available, which roughly doubles the vehicle’s range. When the battery gets to a certain level, the Range Extender starts and maintains the battery’s current state of charge. The all electric i3 has a 22 kWh lithium-ion battery with about a 80 mile range. It has been tested as the most efficient electric car on the market in good part due to its low weight with extensive use of carbon fiber reinforced plastic at 124 MPGe. The Range Extender version never directly drives the vehicle’s wheels and adds roughly 330 lbs to the vehicle curb weight, and has a fuel capacity of just 1.9 gallons. Pricing (before federal or local incentives) starts at $45,200 for the i3 Range Extender model and $41,350 for the pure electric i3. The i3 is on sale now.